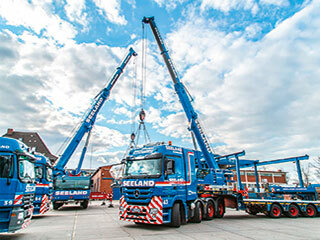 Our ultra-modern telescopic cranes are capable of lifting heavy loads with various telescopic extension arms and variable height adjustments. We offer special customized solutions for every purpose, scrutinize the individual projects with reference to feasibility studies in the form of 3D drawings and coordinate the associated operations. Folding cranes offer a flexible alternative on almost all construction sites thanks to their fully automated assembly and disassembly and high-speed crabs. Even in situations where space is very limited or where projecting edges cause problems. These cranes can be assembled and operated right next to buildings. They are equipped with crab cameras, height-adjustable cabins, and remote control. Mini crawler cranes are extremely maneuverable and are particularly suitable for use inside buildings. Their slimline design enables them to pass through doorways and they are capable of negotiating steps. Mini crawler cranes are frequently used in balcony and facade renovation projects, glass installations, and for industrial applications. 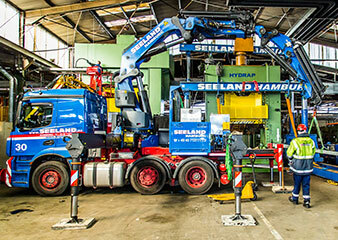 We use our hydraulic loader cranes for complicated industrial installations in confined spaces or to load and unload trucks and other vehicles. They are equipped with endless slewing gear and knuckle booms. 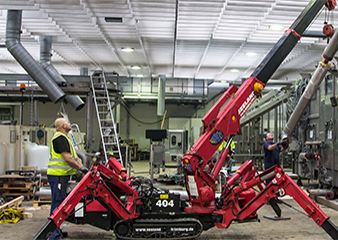 Our hydraulic loader cranes offer an ideal solution for glass installation projects.